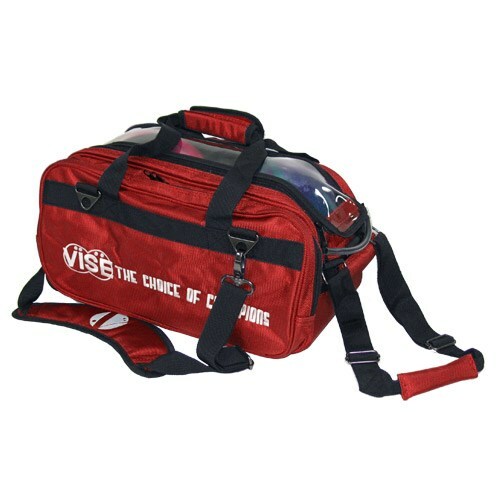 The VISE 2 Ball "Clear Top" Tote Roller comes in a variety of colors to choose from. This bag is made from a heavy duty fabric and has heavy duty zippers. The Padded shoulder strap makes it comfortable if you need to carry your bag. This states it's a tote roller. But in description it doesn't states if has wheels. It's a roller, does it have wheels? Hi Kai. Yes, as a roller bag this does have wheels. The picture that VISE provided for us doesn't showcase them, but they are there. Does this bag have room for shoes? Unfortunately, there will be no room for shoes. will this bag fit in a locker ? Yes, this bag will be able to fit inside of a locker. There is a zippered pocket for storage. Due to the time it takes to produce the VISE 2 Ball "Clear Top" Tote Roller Red ball it will ship in immediately. We cannot ship this ball outside the United States.